DELISLE -Graeciae Antiquae Tabula Nova . . .
DELISLE, G / BUACHE, P - Graeciae Antiquae Tabula Nova . . . Title : Graeciae Antiquae Tabula Nova . . ..
Map maker : DELISLE, G / BUACHE, P.
Size : 19.7 x 27.0 inches. / 50.1 x 68.6 cm. 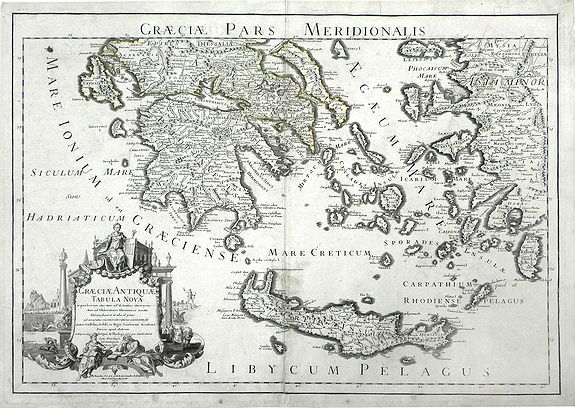 Description :Finely detailed map of Greece, Crete and the southeastern coast of Asia Minor based on a 1707 map by de L'Isle, and later republished by Buache in 1745. Cities, villages, forests, mountains and rivers are depicted, and a beautiful illustrated title cartouche is in the lower left corner. Guillaume de L' Isle was the leading French cartographer of the early 18th century. He was known for both his strong belief in the importance of accuracy, as well as his prolific output of over 100 maps during his lifetime. Guillaume de L'Isle was born into a family of French cartographers, and was the pupil of mathematician and astronomer Jean Dominique Cassini. It is said that de L'Isle drew his first map at the age of nine. His first atlas, which he published at the age of 25, made an unprecedented effort to both correct fallacies of earlier maps, such as the depiction of California as an Island, and to add current data to maps. De L'Isle was elected to the French Academie Royale des Sciences at the age of 27 and was later appointed to the highest honor as Premier Geographe du Roi (1718). His critical approach to the maps of his predecessors, backed by his training under J. D. Cassini, earned him recognition as the first scientific cartographer and the foremost geographer of his age. Philippe Buache de la Neuville was trained under the geographer Guillaume Delisle, whose daughter he married, and whom he succeeded in the Académie des sciences in 1730. Condition : The center crease has been repaired; discoloration and creasing/wrinkling along center crease; discoloration in bottom margin area; small ink spot in the top right corner of the map; small written numbers on top right and left corner margins.